ANGLER has highly competent Microsoft Silverlight development team that develops customer-oriented Rich Internet Applications (RIAs). ANGLER has great experience in developing Microsoft Silverlight applications. Our Silverlight Developers are extremely knowledgeable and are creating software solutions, right from the small to big business organizations. 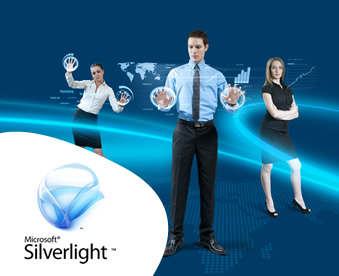 Our Silverlight developers will create web pages by using HTML and WPF elements with Silverlight. We create cross browser and cross platform RIAs, by using Microsoft Silverlight, along with .NET languages (C# or VB.NET) and Java Script. ANGLER, as an Offshore Development Center (ODC) offers quality Silverlight Programmers in India. An additional goal for Silverlight is to enable us to transfer our .NET Framework development experience to Silverlight, and vice versa. We should also be able to port Silverlight applications to the desktop, mainly reusing the XAML. Contact us today to know more about our Silverlight Software development services or to hire our Silverlight developers for your needs.